Audio expression, symphonic beauty, artistic passion, a spatial concert hall feel and the excitement of the audience. Esoteric’s Master Sound Works is an audio product concept that recreates all of the music information in original master recordings with the most state of the art technology available today. Reproduce the beautiful sounds of audio as accurately as they were recorded. The C-03X preamplifier as the embodiment of ESOTERIC technologies, enriches the musical experience of your system to a dramatic extent. 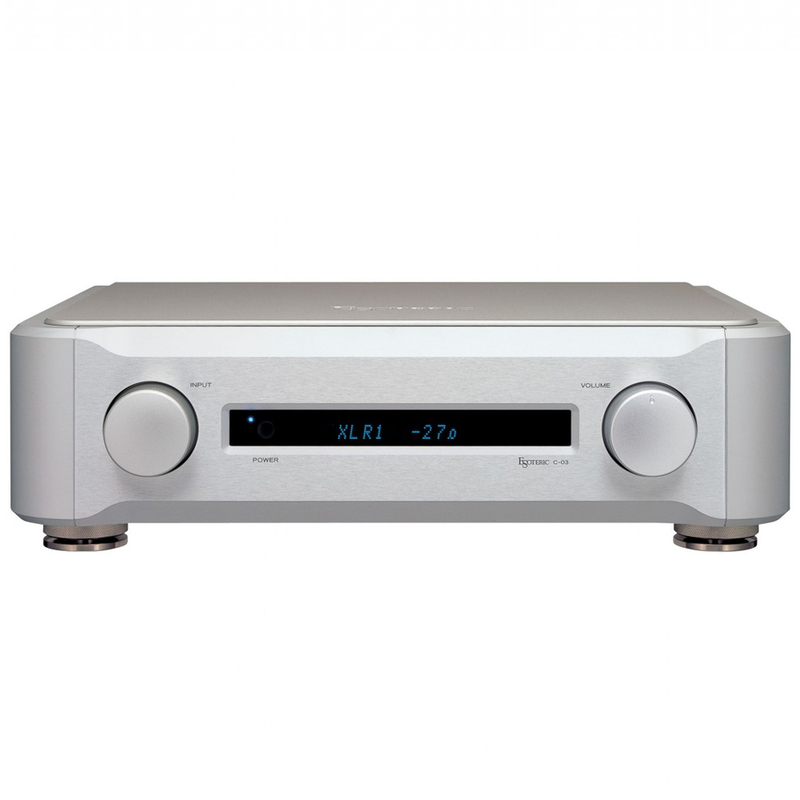 How far can a high quality preamplifier evolve the musical experience of a system? The ESOTERIC’s C-03X is indeed a definitive starting point when considering an answer to the proposition. This brand new full balance dual-mono preamplifier brings out fantastic sonic impressions with seamless, stress-free beautiful sounds. This comes as a fruitful result of ESOTERIC’s analog audio technologies accumulated over many years of dedicated research. Here is the newest preamplifier in ESOTERIC’s “Master Sound Works” series. Dual-Mono Designed for Right-Left Independence The dual-mono design enables the C-03X to have a power source and a power transformer for each of the right and left channels. This was done in order to eliminate mutual interference between the channels and to prevent noise being introduced from the power line. Pure and clean amplification is the great outcome. A Fully-Balanced Configuration Gives an Excellent S/N Ratio Signals are received through the fully-balanced input buffer amplifier design for an individual input system and maintains this balanced transmission at low impedance, so that all inputs can remain free from common mode noise. This fully-balanced configuration increases the purity of signal transmission and provides an absolutely excellent audio S/N ratio. ESOTERIC-QVCS ESOTERIC-QVCS (*) is a volume control system, which takes full advantage of unit’s pure signal paths. By turning the volume knob, the gain variable volume of all the four circuits – right and left channels, positive and negative powers – are activated. In this way, this system keeps audio signals independent (from right to left and from positive to negative), so that sounds are reproduced clearly with good channel separation and accurate phase characteristics. Furthermore, the deletion of cabling from the audio board to the volume device radically shortens the audio signal path and minimizes sound deterioration. As a result, the C-03X can now reproduce sounds that are perfectly suitable for a high-end preamplifier. Enhances the Driving Performance of the Power Amplifier Looking at the subtleties of the signal transmission between preamplifier and power amplifier, the ability of the component to transfer current efficiency determines the overall quality of the system. The preamplifier plays a significant role in this relationship. Serving as a line driver, it should fully drive the power amplifier to its maximum level to thoroughly convey music signals that can include such a broad range of music expression, from pianissimo to fortissimo. What is required here is high performance via high speed current transmission. For the purpose of attaining the ultimate performance of the C-03X as a line driver, the output buffer amplifier circuit uses high quality materials and has its own board separate from the input stage. The output buffer circuit provides the high performance necessary. Its slew rate, representing response speeds of 2,000 V/microsecond – is incredibly fast. Since this buffer circuit is provided to each RCA output terminal and to the hot and cold pins of the XLR output, the instant current supplied gets maximized. 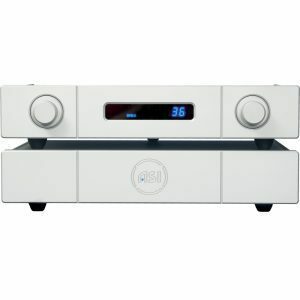 The C-03X reenacts the breathtaking reality of music whose dynamism tended to disappear in older systems during smaller current transmissions between the preamplifier and a power amplifier. Gain per input is widely adjustable with a precision of +/-18 dB = 0.5 dB per step. This reduces volume variations from source to source. Volume balance between the right and left channels is adjustable with a precision of +/-6 dB = 0.5 dB per step. The output phase invert function allows an output that is appropriate for the power amplifier used. In addition, it is possible to individually determine a source-specific output phase and to easily implement phase management for the system. Unbalanced output (RCA), balanced output (XLR) and RCA + XLR simultaneous output are the options. RCA-2 terminals are provided to switch between normal line output and AV through output. 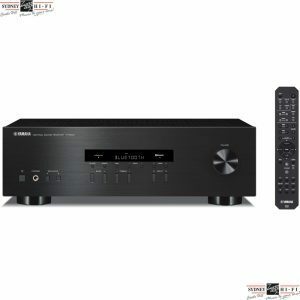 This function allows you to connect AV preamp to the C-03X, sharing the same front two-channel speakers (and its dedicated amplification system) between music and surround movie applications. Source equipment names on the display can be programmed into the system using the remote controller. Display dimmer, mute, auto-display-off functions are also available. MM/MC phono stage board (option) The C-03X is available with on-board MM/MC phono stage as an order option. * The installation of the board includes hardware and software updates of the main unit, thus can only be done at our factory. Please contact your local authorized ESOTERIC dealer for more information. Control Knob – Function and Flexibility The volume knob operates internal gain variable circuits which allows you to choose one of five volume curve options.This flexibility allows you to select the best operability based on the combined efficiency of a specific power amplifier and speakers. Achieved by Rounded Form Adding the C-03X to the system will provide an aesthetic integrity to the system. The front, top and side panels along with the front corners are made of thick aluminum. The rounded shape of the top panel and the corners, where there are no screws at all, are inherited designs from the separate component system of the ESOTERIC flagship line.